Tour Paris and London Together! Spend a week discovering two of the world’s most exciting cities on this London and Paris tour. Savor the must-see attractions, such as Big Ben and Piccadilly Circus in London, and the Champs-Elysées and Arc de Triomphe in Paris. Then get a different perspective as you take a private, narrated cruise on London’s Thames River, and you’ll ascend to the second floor of the Eiffel Tower, where amazing views of Paris await! A high point of this adventure is the high-speed Eurostar train ride through the Chunnel, as you sit back and relax and enjoy the ride between capitals. 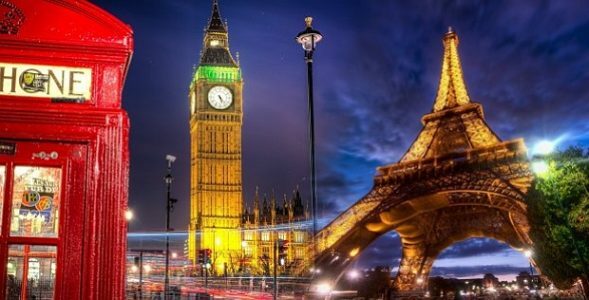 All of this and much more—including plenty of time on your own to explore each city—are waiting for you on this marvelous vacation to London and Paris. Rates start at $1,800.00 per person plus airfare. Dates are available thru December 2017. Call Susan in our Leisure Department at (678) 420-2510 | Toll-Free: (800) 950-2950 or E-mail: vacations@teplis.com to check these two cities off your bucket list!